There is no emphasis on the individual in this scene, from their costumes to their singing and dancing, their is no singular character who stands out more than the other. They sing and dance and act in a way that constantly draws the other characters into the scene rather than overshadowing or dominating them. The number begins with them trying to convince Astaire to join not only their show but the musical number they are performing. Astaire joins in relatively quickly, and it is shown to be to his benefit, as the entire number is crafted so that each piece connects with the next as the characters work to together to show the song's narrative. As I said in the first point, none of the characters are wearing costumes that set them apart. Their clothes are that of the everyday and are in more subdued colours. The colours also do not clash, all three men are wearing suits that contain similar shades, and Lily, while still dressed very femininely in contrast to the men, is not wearing any bright specifically feminine colours, but rather ones that complement that of the men's outfits. Lily and Lester are more comedic than Tony and Jeffrey, who are humorous in this number, but not as overtly as the other two characters. Lester is the most comedic male, and also not as dominant as Tony and Jeffrey. Lily dances alongside the men, doing the same routine as them, but it is obvious in their movements and during portions of the song that she is the female in the number and not entirely one of the boys, although she is not set apart enough to be really othered in the sequence. 1. When one is singing, the others are not only looking at the singer but at each other with a reaction. It's different from the early musicals which only had two main actors singing and dancing with each other. Now we have four people singing and dancing together. 2. The costuming of the characters are very similar to each other. The men's suits are all very similar colours and shades, not one person is standing out from the others. The female character is similar in white and grey shades, matching in with the male's costumes. 3. The staging and interplay between the characters shows us that they are great friends. They are always together in a group setting. The male friendship is shown by the way they often place their hands on each other's shoulders and shake each other's hands. The interplay is one of fun between them. They are synchronized in time together and the dance routine at the end of the clip defines the friendship by the way their actions are exactly the same, a group of four acting as one unit. During the first verse, the characters alternate in singing each line of the song. Each character has their opportunity to contribute to the key idea of “entertainment”. The second verse is mostly sung by all four characters together. They have cemented their ideas on what entertainment can be. Cohesiveness is displayed. Earlier musicals tended to show a character singing a whole verse on their own – there was more focus on individualism. The costuming is very conventional and practical, showing all four characters in standard day wear of the decade. There are no really bright colours to make characters stand out on their own. The characters are relating to each other as a team. They are active in contribution and listening. We see each character doing the same choreography in a single line. The camera stays focused on all four characters together and does not once move to a close up shot of an individual character. 1 - Think about it the first min and 20 seconds the song is around a chair and the 2 men and the women are walking around the chair in a circle singing. Then it starts with the singing and dancing. 2- Nothing much 3 men with suites and a women with a white dress on. The suites are just normal bland colors. 3-They use the stage as one big prop and throw in some old vaudeville gags into the mix. While singing about how the audience can react to various types of entertainment. They move as a group as they entice Tony to see how life gives you ideas for shows, particularly their show. They are not dancing individually and showcasing their dancing skills, which, as Ament pointed out, only Astaire is a trained dancer. They are building the scene to work together. In the past we have seen huge dance numbers with the main character taking the spotlight. They are in muted colors - mainly blues and greys. Nothing is showy - it is suits and a dress that a woman would wear to work not out to a ball. This shows that this scene could literally take place in a work setting and that we are all a team not individuals trying to stand out. They are all goofing around and helping each other in each vignette: lighting a cigarette, a pyramid, marching together, building the scene again as a team. They're performing as a group with each actor having their own lines in order to shine without actually standing out. When one finishes singing another continues. The dance number at 01:27 also tells of how they're all in it together - putting one foot/leg in front of the other people, battling it out until they all end up synchonized again. None of the colors stand out, they're all dressed in blue, grey, black and white. As I have not watched the film, I only know what I've learned from the Daily Dose. It is obvious that Jeffrey is trying to inspire and convince. If they stick together as a team, they can make anything happen. 1. The characters include and relate to one another with comedy and unity. It isn't a competition (like Rogers and Astaire dancing films, where they might be competitively matching step for step), but a collaboration. They don't highlight Astaire, but have him do a simple step on the outside of a trio. There's rarely a moment where one character is by themselves in the shot, and usually only because the others are setting up for the next united gag. Earlier musicals tended to feature fantastic dancers or highlight one voice as opposed to the ensemble. But much like the action, very few lyrics are sung solo. 2. The costume choices bring them together in the color scheme. All three men have colors that tie to each other. Fred Astaire is in a sharp, dark suit with a tie that matches Buchanan. Levant's pants match Astaire's suit and his tie goes with Buchanan's outfit as well. Fabray, while set apart as the only female in creamier colors, still has grey in her skirt to tie back to the neutral colors of her gentlemen. It's a cohesive color scheme, as opposed to putting each of them in a bright contrasting color, or more so, highlighting the star by putting them in a red while everyone else wears muted greys. 3. Much as I said in my response to question 1, the actors are never alone on stage for long. They're always united, whether as a duo, trio, or the whole quartette. It's a playful song where they are physically interacting every step of the way, telling a story together as opposed to one person telling a story while the others provide background. In this scene it is obvious that it is a "group effort" in that there does not appear to be a star of the show. They are dancing and singing together, with lead-ins (if you will) from one line to someone else's. Wonderful clip. The costuming is rather subdued compared to most musical numbers, I feel. But yet, they compliment each other's - shades of blue and black in Astaire and the other singer as well as Nanette's grey coordinating with Lavont's jacket. 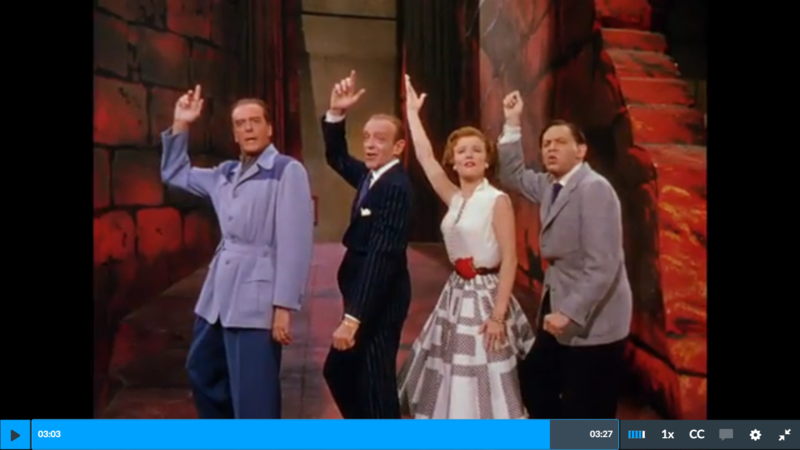 Minnelli still pulls off a great song and dance number even though it is not the norm. This whole song is rather "whimsical" as Vanessa would put it and just fun. One bit running into another - the handkerchief brought out on stage and handed to Astaire, the pyramid built, only to have the bottom piece walk out without it toppling down. That is entertainment! The interaction of the ensemble is perfect. They are making eye contact with each other as the lead singer changes from each one. that's important and shows respect as that no one of them has a greater part in the piece. While the dance scene starts with the 3 together, there is a little competition between them and the is good-natured and part of the scene. No one person had a greater part...there was role equality and each dancer was a lead. That stands out when i think of the partner dances and how it feels as if the woman is just an object to be lead and twirled on the dance floor. 1. At first they are trying to convince Tony who is quickly convinced and joins in with all the ideas for a show based on real life events. The difference is than the four of them are working together, they have an equal part on this number. 2. They are wearing their regular clothes. 3. They are friends and they have knowledge of show business and play little parts and use props. They are working as a team to come up with a show. 1. The 4 characters come from different backgrounds, still tied to the theatre, but different focuses. They also all have varied motivations about why they want to do the musical. The 2 writers are all set, the serious director is on board and has a vision, but they need to convince the top billed dancer/actor. The song sets the tone for the idea to come to life. It brings in many sight gags and jokes, but still ties the characters together in one common goal. The song is a way to has out what they want to accomplish and where they each stand. This is different than earlier musicals because they is more of a balance with the characters, there is not just one star, they all have a focus and are tied together. Not quite like the 40’s unity theme, but more of a group of unique individuals, each with a different role, coming together to advance their idea in their own way. That if all contribute to this goal, will produce a success. That even though their talents are different, the number tries to place them all on the same playing field/level. 2. The costumes have a cohesive theme. The colors are subdued shades of blue and gray. The writers are both in grays, and the actors are in blue. No one is overtly flashy or dressed differently, they all fit together and look like they are in the same brackets. The colors blend together and form a unified color theme. They are in neutral tones. 3. The interplay between the characters help to further develop their roles. The two writers are usually together or side by side when the 4 are on stage. The British actor/director is leading the discussion and pointing his partners (directing them) to get on board and see his vision. The writers are also more in tandem with each, but there is still a camaraderie with the actor/dancer. You can see and feel Fred’s reluctance, but eventually agreement as the song progresses. I want to start off by discussing the costume choice and color palette. All are dressed in blues and grays. Check out Nanette's skirt. It compliments Oscar's jacket and Jack is wearing a blue and gray jacket. Oscar's tie, in turn, compliments Fred's jacket. There is no rivalry that we saw in earlier "backstage musicals" of this type. They are collaborating together, at first getting Fred pumped up and once he joins in to improvise and celebrate entertainment. As in the film, even though everyone is collaborating on the same subject, the relationships are clear - the main two are Fred and Jack, followed by Nanette and Oscar as support. Nanette is the girl friend, as opposed to a girlfriend. And Oscar is Oscar, almost a third wheel but needed. BTW - Watch Oscar's hands. I got fascinated by watching his hands during the song. When extended, his fingers are curled as if he were playing the piano, but often his hands were held in a fist - most prominent at the end. As if he didn't dare risk hurting them. The interaction between the characters is cohesive. Each time a character takes action within the dance number, its purpose is to build and set up a complete goal within the number, for example, how they all work together with the standing door prop to reveal the rest of the cast. It differs from earlier musicals in the sense that everyone is featured equally within the number with no actual ‘lead’ in the scene. This was the first thing I noticed once the clip began to play. The distinct wardrobe of each of them showcases their role within the entertainment ‘family’, just as an actual family would be distinctly dressed (father, mother, son, daughter). Separately, it wouldn’t be a big deal, but when seen altogether, it would identify their roles within one unit. I notice that their interaction along with the use of props help to signify the actual ‘behind the stage’ relationships of each. For example, within the number, Minelli utilizes the interplay of Astaire and Buchanan in hats as ‘star’ and ‘director’ bickering creative ideas, the utilitarian roles of the writers carrying the ladder or lighting the cigarette of the director, signifying that the director has certain liberties. In other points in the number, the star and writers follow the director in line from the prop door. In addition, when they create the human pyramid, the writer serves as the foundation of the creativity, supporting the director, the star and his writing counterpart. I noticed that they dance and stay together in unison. They are all the same size on the screen, there is no focus on one more than the other. This is different from early musicals where they highlight individual talent or pairs. The colors are neutral, dark navys, pale blues and plain white. The colors are meant to blend together instead of stand out individually. There is a fun interplay between the characters that shows they are working with each other and feeding off of each other's creativity and ideas by the playfulness with the props and working together to make a scenario funny. The choreography allows all characters to "play" off of each other in a very even way. The characters are all given an equal chance to entertain. No one actor is given more time or a long time in front of the others. Equality is a theme. As for the costuming, this has an aire of equality as well. No character is dressed better then any other showing all characters on a level playing field. None of them stand out because of how they are dressed. This scene shows none are better off than the other. Each character interacts well with the other. The contrast color ot the red and green cause the bland costumes to stand out. 1. The scene as a whole is very interactive, as the gags tend to require multiple players instead of emphasizing the humor or talent of one. In the beginning, Fabray, Levant, and Buchanan surround Astaire and act as a cohesive effort to bring him to their side; the configuration of three against one makes clear the idealistic disagreement at this point in the scene. Once Astaire joins in, there's an emphasis on configurations of four (besides the moment Levant steps out, which seems to be for practical reasons of dance ability), and even when the characters aren't arranged in this line of four, they're often coupled to show cooperation. There's a couple moments that seem to toy with the question of how cooperation is or isn't necessary. For instance, the false pyramid gives the illusion of a team effort, but when Levant steps away it's clear that it's a visual trick. Levant's ability to carry the ladder all the way around by himself is also something that should require two people. When Buchanan is lighting a cigarette, he's surprised when it turns out to have been a team effort (Levant from behind the wall). As a whole, there's an emphasis on interaction and how it fits together with showmanship. In other movies, dance scenes have tended to be either focused on a few central performers- Fred and Ginger in Top Hat, Eleanor Powell's solos in Born to Dance, Gene Kelly's ballet at the end of On the Town- or large ensemble numbers, like those of The Broadway Melody. Here there's a focus on individuals as they work together. 2. All the costumes are somewhat formal and in shades of grey, white, and blue. There's no one who really stands out, though no one is wearing exactly the same thing either. I'm not sure we're intended to pay much attention to the costumes, except in that they tie the characters together as a team. 3. It's staged to point attention at the group rather than the individual. Most of the shots feature multiple characters. There are a few moments that highlight one over the others-- Levant's ladder trick, Fabray's hip thrust--but nothing that takes attention away from the group dynamic. 1. For one thing the number they did is about equality so the spotlight is spread evenly with the four. It is different from other musicals because it concentrates on four characters who are all relying on each other, and you feel like you are watching a group routine rather than watching Astaire. It sends a wonderful message of unity. 2. The Three men are dressed suits and the lady in a dress but the clothing is nothing outlandish everyone just sort of blends together so that you see them as one unit rather than four individuals. 3. It has a sense of playfulness, the reason the gags in the scene are old hat is so that they are doing the jokes ironically which is why they still come off as humorous. In the scene it shows how they all worked together but in a playful manner which indicates that they are comfortable with one another. They are a cohesive unit instead of having one star stand out, while the others merely observe. They are all participants. Each person is contributing to the song and dance. In past musical numbers there is usually one stand out star/focus while the rest of the cast at that moment merely is in the background observing until that portion is over. They are neat and nice (tailored). The colors are also rather neutral (blue/white/grey) with no bright splashes to call your eye to any one person. Plus, there are no baubles or sequins to garner anyone's attention over the other. 3. I noticed its an ensemble, and the staging really drives that point home. No one character is just there, each one sings and dances, being the focal point at one time or another with all four performing equally. Each persons talent is highlighted and featured. You can see true camaraderie between them. As you watch the interaction between the four characters﻿ in this scene, what do you notice about the way they include each other or relate to one another? How is it different from early musicals we have discussed? The characters are relating to each other in a way friends do ....the closeness is there. And the support. Fred Astaire, style itself, suave. Neat as a pin. Nannette ... the fluffy crinoline, the slash of red around her waist but the dress very beige. Ok, the best for last. Oscar. Rumpled, world weary, just tossed on suit, .... who cares about his clothes? His face, like a benevolent Bassett hound. Oh I don't know. They all seem to be having fun. OK, I’m going to go away off topic here and start with how much I love Oscar Levant. His understated with, his musicianship, and what he brought to the movies that he was in I just find incredible. If you haven’t seen this yet, look up the first episode of the show that he had on network TV. Fred Astaire is his first guest, and of course Fred sings on the show. It’s just such a throwback to a simpler time. As for the movie clip we were shown it’s very interesting looking at the choreography. At some point the characters are trying to outdo each other but eventually they come together and work as a group. I had not noticed that before, but I think I’m going to take a closer look at what the choreography is trying to convey. Even little subtle things like that. Very interesting. The characters in this scene truly seem to be working as a group, without any one of them being the focus. This is different from earlier musicals in that early musicals usually had one person in the numbers who was the focus and the rest of the performers were in the background. The earlier Astaire films that were discussed showed him as the star and highlighted his dancing with Ginger, and everyone else was just set decoration. All of the men are dressed in suits of varying hues of blue and gray, and Ms. Fabray is dressed in monochromatic tones as well with just the tiny pop of red at her waist. This also works to show them as a group rather than singling out anyone as the “lead”. All of the characters come across as equals, but all are playful in their own ways. 1. The four of them have mostly equal time focused on them. One person doesn't dominate the scene. In some of the other musicals, the focus was on a couple or one person at a time. 2. I had to go back because I couldn't really remember what they were wearing. The men all have variations of suits, mostly casual. She has some color in her skirt but not enough to draw away attention from the group. 3. I think the togetherness of the group and the way they play off of each other shows how they are going to develop a play. They can be funny with each other and throw ideas around. This ensemble performance is a great illustration of the class points about cooperation and being a natural kind of "conversation" integrated into the story line. But as has often been observed about this sort of egalitarian, democratic kind of enterprise, it's also pretty dull dancing. (I'm a huge fan of Oscar Levant also, but including him as a dancer here and in Silk Stockings is fairly ludicrous.) This is admittedly a great number -- but it's a darn catchy tune and clever lyrics that makes it, not the goofy sight gags. I think it's nice to set the bar so low that everybody can participate -- community is great -- but that attitude doesn't always lead to excellence. As you watch the interaction between the four characters in this scene, what do you notice about the way they include each other or relate to one another? How is it different from early musicals we have discussed? The characters in this scene relate to one another as more of an ensemble, rather than 1-2 stars (such as Judy and Mickey) standing out in a group. The pyramid move in the "That's Entertainment" number shows this perfectly, as each character depends upon the other for balance and support. What do you notice about the costuming of the characters that indicate cohesiveness of the ensemble, as opposed to setting anyone apart? Be specific. All of the colors are in dark or neutral colors that coordinate together well. The colors also pair people together. For instance Nanette and Oscar are paired together in the film as husband and wife, and their costumes coordinate in gray (he with a gray jacket, and her with gray in her dress). Fred and Jack are both in blue - not a couple, but in a color that coordinates with the others. What do you notice about the staging and interplay between the characters that helps define the relationships between the characters in the song? They play together as an ensemble. However, when they move, Oscar and Nanette typically move as a unit (they are a married couple in the show) and Jack and Fred move with the ensemble, but with more independence than Oscar and Nanette. They are a bit more free to do gags like the latter. Nevertheless, no one character stands out in the staging. The four are centered around center stage. The way they were tossing out ideas in the song could have taken place sitting around a conference table and the music and the words played so well into the feeling of working together. From the first view of the scene, they all moved in unison. All wearing similar colors, all with their same arm and leg movements making you see one action and one group in harmony. When they move around, they move like a single unit. Not one star performing alone, a complete group performing in unison. Loved it!